Radio Free Europe (RFE) correspondence with anonymous sources from behind the Iron Curtain. This item was transmitted from the Vienna field office. 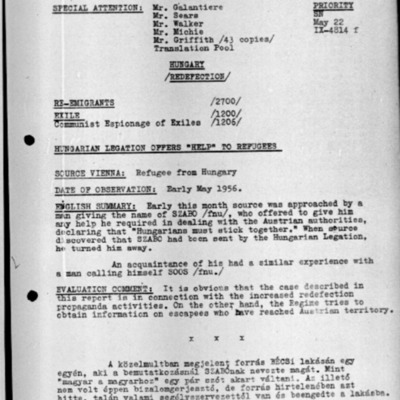 Radio Free Europe/Radio Liberty Research Institute (RFE/RL Research Institute), “Redefection: Hungarian Legation Offers "Help" to Refugees,” <1956> Digitális gyűjtemény, accessed 2019. április 25., http://1956.osaarchivum.org/document/fefa637f-aaba-413d-a815-57fe48d15eb2.